Feedback on the Breakfast Networking Seminar: What are Eco-labels? EcoStandard South Africa hosted a successful breakfast seminar to product manufacturers on 3 September 2015 at Hotel Verde in Cape Town. The presentation, by Sally-Anne Käsner, was a highly informative look at Eco-labels, what they are, how they can benefit a product and company and the overall aim of what such labels are trying to achieve. Sally provided further insight into EcoStandard South Africa and explained the assessment process and the benefits of having a product assessed. Some of EcoStandard’s assessed products were present and were provided with the opportunity to showcase their products via banners, flyers and information brochures. Following on from Sally’s presentation, Jenni Lombard from the Green Building Council of South Africa (GBCSA), presented an informative breakdown of the Interiors Tool and the Materials Category, providing insight into the categories included in the tool, how the points are allocated, and how one automatically scores certain points if the product has an approved third party Eco-label. Jenni confirmed that all products obtaining a 4 or 5 Star rating from EcoStandard would automatically achieve a level A in terms of the GBCSA ranking system for the relevant category under Materials. The two presentations were followed by a questions and answer session and then by a light breakfast, which allowed for further networking opportunities. 2016 has been an exciting year for EcoStandard and as the year quickly approaches the end, we are already planning continuous improvements for 2017. A new development is that our certifications will now be valid for 3 years. Our intention is for products to continuously strive for better performance, but have realised that improvements to process and / or design of products takes a little longer than 12 months. Therefore, in the interest of ensuring that we are offering the best for both product manufacturers and verifiable information, we have decided to extend our validity. However, if a product wishes to renew prior to the 3 year cycle coming to a close, they are able to apply to do so! We have also developed a process for once off certifications for those products that are location and site specific. We work in an every changing and innovative space and on some projects, building materials are specific to that application. EcoStandard would like to recognise these products and provide the third party verification of their green claims. This is an exciting development. In light of the above, we have revised our fees. These are still free to view on our website: www.ecostandard.co.za. A new website in 2017! Industry events! Much more! 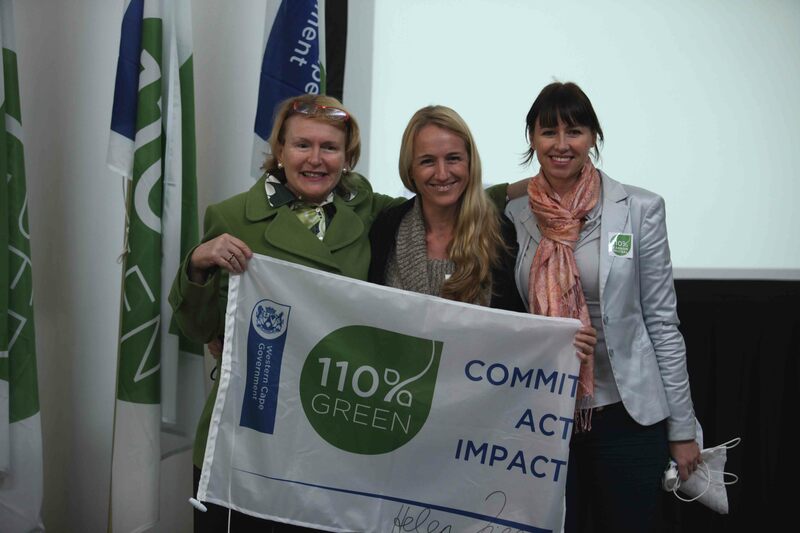 EcoStandard has committed to the 110% programme of the Western Cape Government in order to stimulate the Green Economy and received their flag on 4 June 2013 from the Premier Helen Zille at a prestigious event at the VPUU centre in Khayelitsha. EcoStandard is an independent, third party Eco-Label for to evaluate building products. EcoStandard is Non-Profit Organisation (NPO) started by Jeffares & Green and Eco Exhibit. EcoStandard, the first South African Eco label for products in the building and construction industry, aims to be the trusted certification body for the setting of environmental standards of excellence when rating a product, manufacturer and/ or service provider within our local building sector. Currently there are no locally originated assessment tools available; hence the founding of EcoStandard. Registered as a non-profit organisation (NPO), it aims to design and launch the very first South African criteria and assessment tool, which will be third-party audited and verified to rate and certify the legitimacy of green claims. Through this, EcoStandard intends to establish a portfolio of certified and rated products all of whom will have received an EcoStandard EcoProduct label. By providing both the trade and consumer market with clear and useful information through this portfolio, EcoStandard aims to assist in eliminating fraudulent and dishonest marketing claims. Originally conceptualised and driven by Rayne Neave; founder of Eco Exhibit, a permanent exhibition space providing developers and builders with an opportunity to view eco-friendly products and services in one convenient setting, it has since been joined by Jefferas & Green, a diverse engineering and environmental consulting firm. Their combined vision is to create a culture of environmental excellence in South Africa’s building industry by providing a trusted certification body. The building industry has increasingly been moving towards sustainable development accompanied by market demand for eco products, materials and services. However, the ability to distinguish between a legitimate eco product and one that is not remains a grey area, allowing for green washing to discredit the genuine supplier. This is of huge concern within the professional building sector. The initial target are “early-adopters” within the building and construction industry, namely companies who are already producing environmentally responsible products and have identified the need for a credible way of conveying this information to their consumers, via a third-party audit. EcoStandard is confident that in setting high environmental standards, represented through a trusted brand mark, namely EcoStandard, it will help to decrease green washing whilst increasing the demand for, and confidence in, certified products and practices. Their objective is to connect and engage with government, major corporations and consumers at large to encourage the need for all sectors to participate in the movement towards environmentally responsible consumerism and choices that will ultimately benefit people and planet. Eco Exhibit is a permanent exhibition space allowing developers and builders an opportunity to view eco-friendly products and services in one convenient setting at Northgate Estate (Ysterplaat), Cape Town, and serves as a marketing and information hub to promote and encourage sustainable developments. It is privately owned and managed by Rayne Neave, granddaughter of Laurie Wale – a pioneer in the South African building industry. A touch screen service with online exhibitor portfolios helps orientate visitors while a product consultancy service is offered by Eco Exhibit’s staff. There is no admission fee and the centre is open daily.